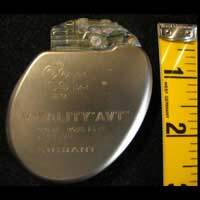 Implantable cardioverter defibrillators otherwise known as ICD’s are medical devices used to prevent death from cardiac arrest.An ICD is a mechanical piece of equipment that is implanted into patients who are at risk of suffering from a cardiac arrest, which occurs if the heart suddenly stops beating. The device is approximately the size of a matchbox and is situated under the superficial tissues around the collar bone area. Using sensors, it can detect the rhythm of the heart and detect any occurrences of undetectable heart rate or dangerous rhythms that may lead to cardiac arrest, upon which it fibrillates the heart by sending electrical impulses to it to prevent death. Who May Require This Device? Anyone who has a history of previous cardiac arrest may be a good candidate for receiving the aid of this device, especially if the cause of the arrest is known to be caused by abnormal heart rhythms known as either VF (ventricular fibrillation) or pulseless VT (ventricular tachycardia). These types of heart rhythms cause the heart to work ineffectively, prevent blood and oxygen from being pumped around the circulatory system, including the blood supply to the actual heart muscle, which leads to tissue death and cardiac arrest. Some of those who have suffered these conditions may be more at risk of future occurrences and will therefore benefit from having one of these devices fitted. The device will detect the rhythm and try and correct it by pacing the heart, similar to a pacemaker, with the added function of sending an electrical shock to the heart when needed. Much like a normal pacemaker, the device is often fitted using just sedation and local anaesthetic. The surgeon will make an incision in the chest wall after the local anaesthetic and sedation have been administered and have taken effect. The device is inserted and pacing wires sent through the system to the heart muscle using x-ray technology. It will then be tested to ensure it is working correctly. The patient will be required to attend follow up appointments during which the history of the device will be checked along with the existing condition of the device and any occurrences of events will be recorded and medication regimes can be amended or commenced in order to try and prevent further developments. As with most surgical procedures, there are a few risks and side-effects involved though these are rare and can often be prevented or treated. As with any surgery, there will be a small risk of infection, but this risk can be minimised by the surgical team who will use a strict aseptic technique whilst operating. The patient can also prevent infection by maintaining hygiene and allowing the wound to heal without interference. There is a very small chance of an allergy developing to the sedation or indeed the device but this is extremely rare. The most common side-effect occurs when the device detects a possible change or lack of heart rhythm, upon which the device sends a shock to the heart. Patients have reported being able to feel the action and have likened it to being kicked or thumped in the chest. It is a sudden action and the discomfort passes quickly. Many patients feel secure from this action as they know that the device is working. ICD’s are similar to pacemakers as they can monitor and detect changes in the rhythm of the heart. They have the added function of being able to correct these changes by conveying an electrical impulse to the heart, preventing sudden death occurring.